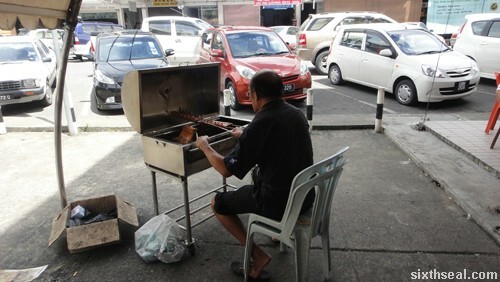 There is an old man that sets up his humble grill in the afternoons at a coffee shop called Chatterbox Dessert and Cafe. It doesn’t even have a name. I first thought he was a customer, since he was just sitting at a table chilling there with a cold beer. Joanna ordered some chicken wings and the person told us it’s going to take 30 minutes. I finally met up with Joanna just now for a very late lunch. It turns out that she lives just one street across from where I’m staying in Miri. We’re practically neighbours and never realized it. Heh! She brought me to this legendary place which is supposed to have excellent chicken wings. I hear he only prepares 200 chicken wings every day. He doesn’t do more even though the demand is there. I’ve only seen ONE (1) customer in addition to us who managed to order his acclaimed chicken wings. The next one that came along was turned away coz he told them that he’s out of chicken wings. Now, this is quite puzzling since we’ve only been there an hour and to the best of my knowledge, only two people ordered the chicken wings. It turns out that the rest were “reserved” – it has been pre-booked by another customer so he’s not even selling a single chicken wing to anyone else. This is one of the rare instances where a stall successfully manipulates the supply and demand of his wares well. I think manipulate might be the wrong word to use here since the man doesn’t seem to be interested in mass producing inferior quality BBQ chicken wings. He displays passion – watching over the BBQ grill with a determined and almost ferocious intensity. He’s a man that won’t be rushed too. He refuses to serve the chicken wings until it’s properly done according to his standards. Joanna went over after a while and said it’s okay, we’ll just take it as it is. However, the man politely declined with a smile and said it’s not done yet. It looks done and it smells done but he won’t serve it until HE DECREES THAT IT’S DONE. You just gotta admire that. Heh! The chicken wings costs RM 2 each. Joanna paid so I can’t be sure but 5 chicken wings at RM 10 comes up to RM 2 each, unless my math is way off the mark. 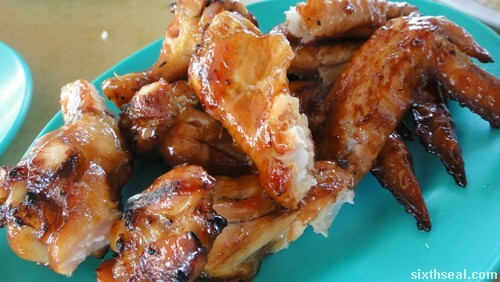 We also had chicken rice while waiting for the BBQ chicken wings to be done. 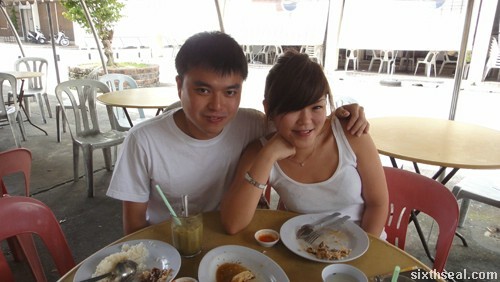 I remember the last time I met up with Joanna in Sibu during Chinese New Year, we had chicken rice too. Or at least, I had chicken rice…she didn’t eat. haha i know this place. 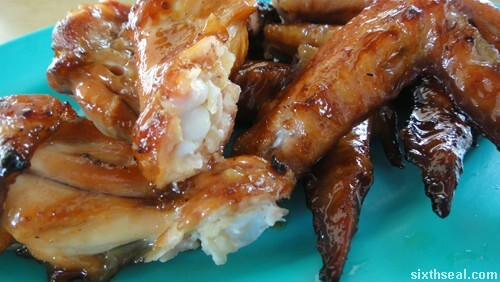 delicous chicken wings but have to be fast to buy. Yup, it’s amazing how he limits the supply and increases the demand and people still go back. Then again, a lot of other people do that. The man has passion towards his wings! GOD, those wings look mighty good! Dude, in Miri is it? Since its so delicious, he has a limit on how many he serves. HB, here is not or season yet for Bar B Q but we do have lot Bar B Q restaurants around in San Francisco for ribs, and chickens ect. Hotdogs is one things people like and that is burned it so for that awesome taste you can’t get on regular grill. haha 200 only? this reminds me of the total opposite situation in KL’s Jalan alor where they sell them by 100’s and the smallest portion’s of 20 wings at a time. 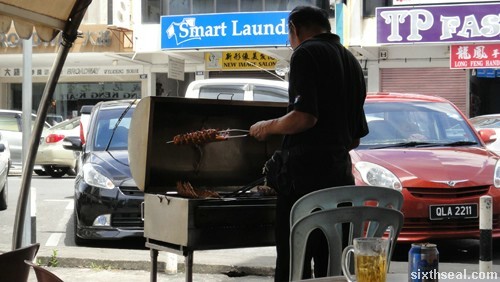 I had a lot of good food in Miri – plenty of interesting places like the roadside stall famous for roasted chicken and Hokkien mee.